Hoping to get a better look at the woman, psychic medium Addison Lockhart leans out over the manor's windowsill, gasping when she feels an intense pressure pressing down on her back--someone thrusting her forward. She grabs the side of the window to brace herself, but it's too late. She's already falling. Who is the strange, melancholy woman haunting Blackthorn Manor? And why is someone out to keep Addison from unlocking the manor's darkest secrets? If you enjoy mysteries with a supernatural twist, you'll love this fast-paced, bestselling series by a New York Times and USA Today bestselling author. *"I couldn't put it down." "Held my interest until the end." "Twists and turns you won't see coming." A Must Read in This Series! Book Three in the Addison Lockhart Series is a great new addition to this excellent collection! Once again, Cheryl Bradshaw exceeded my high expectations and left me eagerly awaiting book four. Addison Lockhart is a psychic medium and her compassion and empathy for those she helps makes her a very engaging protagonist and adds a strong layer to all the books. It also adds that new "something" to this thriller mystery and makes it stand out above others in this genre. This novel begins with Addison's wedding and twists and turns the reader around so masterfully that I was blindsided at the ending!! Loved the book and definitely highly recommend! On to book four, please! Thoroughly enjoyed this third book in series. Suspenceful and thrilling. 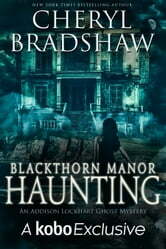 Blackthorn Manor Haunting by Cheryl Bradshaw is the 3rd in the Addison Lockhart paranormal mystery series. My Synopsis: Addison arrives at Blackthorn Manor on her wedding day, only to find the spirit of a woman in black waiting for her. Although her grandmother assures her that the dead cannot hurt her, Addison wonders who pushed her out the second story window. Thankfully someone unseen cushioned her fall. Still, it's not a great beginning to her special day. As Addison investigates the mysteries of the manor, she finds the spirit of a young boy, who tells her he will be leaving soon. Two spirits, a manor with a lot of secrets, and the owner a rather cantankerous old woman who refuses to answer Addison’s questions. She has her work cut out for her, and there are more deaths ahead. My Opinions: Okay, the first two books in this series were entertaining light reads. This one was really good. It had much more depth. The plot and twists were better, and although some of the dialog was a little stilted, overall, I enjoyed this book. Maybe I’m just getting used to the characters, but I am looking forward to the next one! I’ve always enjoyed Cheryl Bradshaw’s books, but I was never a fan of stories encompassing the supernatural before I decided to try this series and as usual Ms Bradshaw delivers on every level: likeable, well developed characters, an intriguing mystery with an unpredictable outcome and a writing style that is both smooth and easy to read along with a little dash of humour. 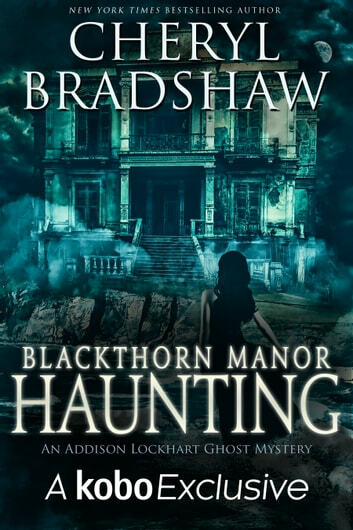 Of the three books so far in this series I enjoyed Blackthorn Manor Haunting the most and look forward to reading a sequel in the near future. So, if you’re looking for something a little different and don’t want to compromise on quality I recommend you give this series and this book a try. I’m sure you won’t be disappointed.